One of the foundations of our friendship is a shared love of ghost stories, so as soon as we read this script we knew we had to produce it. In addition to the supernatural elements, the story is rooted in a very real, painful place-becoming a parent and all of the fears and doubts that come with it. We were very lucky to have such a talented cast to help bring it to life.
" What a weird, twisted, creepy, perfect little gem of a show. I can always count on Creative License to find work that makes me think, and usually work that’s new to me, both things I love. " " Thank you to Creative License for, yet again, bringing new work to the area; it’s not often we see something this interesting and innovative, especially not with acting and direction this strong." " Creative License has assembled an excellent cast and “Mine” is well performed under director Casey Polomaine’s more than capable hand. " " For those who like their theater a bit on the scary side, go and make “Mine” yours." As a first-time mother about to have a home birth, Mari is certain of one thing: she can't wait to hold her baby. The next morning, shes certain of something else: the baby in her arms is not her baby. A contemporary thriller with age-old roots, MINE explores an unseen world where doubt and certainty blur and madness vies with reality. Pool (No Water) was unlike any script we had ever encountered. The chance to start with a script that offers very little-no defined characters, no defined line assignment-was both exciting and terrifying. Building this show with these 4 fine actors was truly a collaborative experience. A famous artist invites her old friends to her luxurious new home. For one night only, the group is back together. But celebrations come to an abrupt end when the host suffers an horrific accident. As the victim lies in a coma, an almost unthinkable plan starts to take shape: could her suffering be their next work of art? 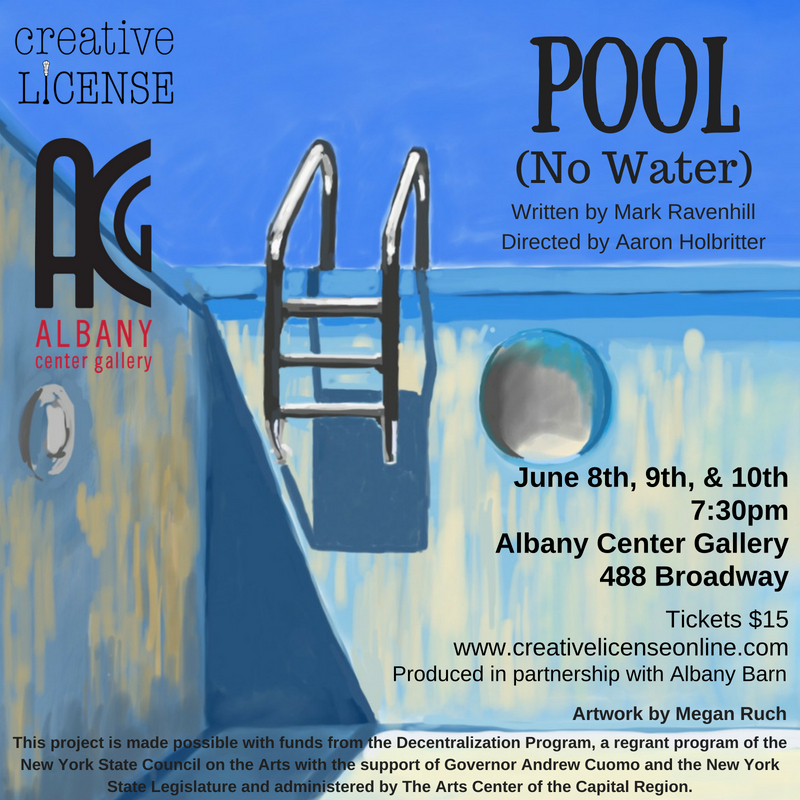 Pool (No Water) is a visceral and shocking new play about the fragility of friendship and the jealousy and resentment inspired by success. "Mr. Ravenhill’s writing has a hypnotic beauty itself, as the locked chambers of each of the character’s minds are slowly exposed... The play is full of perceptive commentary on the tension between affection and antipathy among friends — and the interior tensions in the individual soul between self-love and self-hate. This project is made possible with funds from the Decentralization program, a regrant program of the New York State Council on the Arts with the support of Governor Andrew M. Cuomo and the New York State Legislature and administered by the Arts Center of the Capital Region. It was very exciting for us to find a new play that touches on current issues like the lasting effects of bullying and the weaponization of social media, and that it deals with these issues through the lens of characters who seem very real and of our time is what ultimately made us want to produce this show. "As created by a cast that is the most uniformly excellent of any Creative License I've seen — they're as good here as the best professional ensembles in contemporary dramas in the Berkshires and at Capital Repertory Theatre — these are real people: flawed and recovering, misguided and well intentioned." When Dennis Sullivan (Nick Bosanko, The Picture of Dorian Gray) wins the academy award for his screenplay, ‘White Plains’, based on his experiences growing up in the Westchester suburb and the suicide of his best friend, he calls out the name of his high school tormentor, Ethan Rice (Ian LaChance, Lonely I’m Not, Row After Row). As a stunned Ethan watches, a social media firestorm erupts and both men’s lives begin to unravel. From White Plains deftly explores the lasting effects of trauma, the harshness of the social media landscape and the evasiveness of forgiveness. Isaac Newberry (Mine) and Steve Maggio (Pool-No Water) also star.